In my previous post, I linked to my in progress videos. In video, Part 2, I talked about breaking some rules. Now, in my 3rd video, I both clarify and elaborate about three unofficial mosaic rules that I am breaking. I Heard the Mountain Sing, in progress. 30” x 12” | 76cm x 30cm. Marble, amethyst specimens, pyrite, glass, porcelain. Believe it or not, I found that gorgeous large amethyst cyrstal slab in Zermat, Switzerland, for a very reasonable price and only about $50 to ship. The slab measures approximately 5 1/2” x 9” | 14cm x 23cm. It is close to 2 1/2” | 6cm thick, which required that I build up the substrate around it. If you want to learn more about how I am making this, check out my Work In Progress videos for this project. Just a brief video on finishing the edges. Previous posts on this project. Continuing where I left off, I talk about my palette and how I am using the Procreate app in my design process. By importing an image of my proposed palette (at left) into Procreate, I was able to create swatches that I could use to refine my palette and play with design ideas around color and shading. Good progress in the past few days! I got to the point where I was really enjoying working on my drawing of andamento lines and working out how I needed to navigate the flaring and some of the trickier intersections and diversions of flow. In this video, I will discuss how I got to this point and some of issues that came up. At left is my drawing as of this video. There are a couple of areas that I will be tweaking, and I talk about those in the video. Right now, I feel it is about 99% there. I'm very happy with the flow and the overall size of the pieces, especially the shape and placement of the larger pieces which will be cut from smalti B-cuts and pizzas. Next, I'll finalize my palette and how I want to work with the shades and values that I have. Well, I had intended to get back to a larger work I started before Stabby, but I felt inspired to play around with my backyard shale and some special wayfaring stones. The bottom large piece of shale had an interesting crack in it that resulted in a kind of a cavern. Before I knew it, lava was flowing out of it. The smaller stones are sparkly with crystalline patches. I tried to capture the sparkle in the below pic, but it's just barely there. I'll try for better photos when the mosaic is finished. Stabby 36" x 36" | 91cm x 91cm. Smalti, vitreous, contorno, glass rods, other glass, Swarovski crystals. I've completed the 170 squares that make up Stabby's head. Now, I'm cleaning the glass and the gaps around the squares. Allison has floor to ceiling windows in her condo, and these windows will be facing the mosaic and shining some pretty bright light on Stabby at times. I want the gaps and any exposed cement to be as clean and neat as possible. 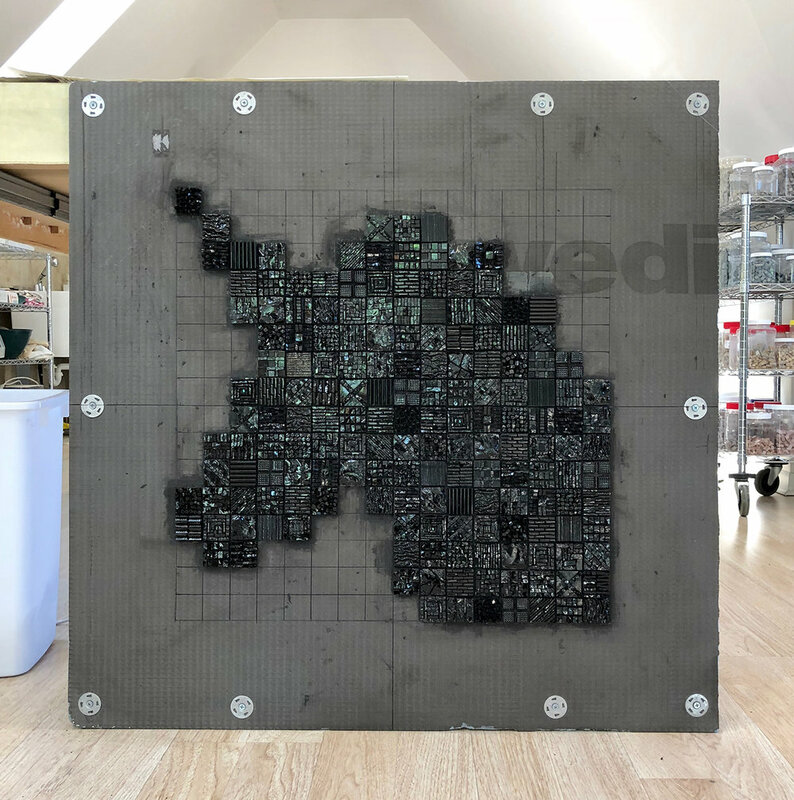 Next, I will use some black cement colorant to darken most of the exposed charcoal cement, especially the gaps around the squares. The Wedi washers that you see were used to attach the Wedi panel to a wood support frame on the back. I'll attach a metal floater frame—Allison's choice—to that wood frame, and also install the hanging hardware onto the wood frame. I don't trust the metal hangers that come with the floater frames; they tighten into the frame with tiny set screws and I feel that I need more robust hangers for such a large mosaic. I'll be visiting Allison in San Jose in June. It looks like I will be able to arrange for it to be delivered while I am there, and the two of us can hang it. We are both excited to see it on her wall. As of the above photo, 112 of the 170 pixels (squares) are finished. My daughter is very excited about how it is coming along, and I am enjoying working on this. For background on this mosaic, see Stabby. It is interesting to see how the various patterns reflect. In the photo at top left, the darkest square is an awesome spikey pattern made with Kismet tiles cut in slim right triangles, which are the offcuts from another pattern. The photo at bottom left shows a closer-up view. I don't think that this pattern will stand out quite so much when the piece is upright. There is another pattern that is similar, but with smalti and not as pointy, and the pieces are more squarish, so closer together (shown in this blog post). The squares in this pattern also look very dark, very black. I will be putting the piece upright soon, and will have a better chance to study the reflective variations from the proper perspective. There will be a lot of finishing work to clean-up the squares. I'll be using a black cement colorant on visible thinset due to it being not completely black. This piece has been tricky in dealing with such a variety of materials, all of varying thicknesses. I'm using a combination of raising some of the pieces with porcelain tiles underneath and controlling the height with thinset. 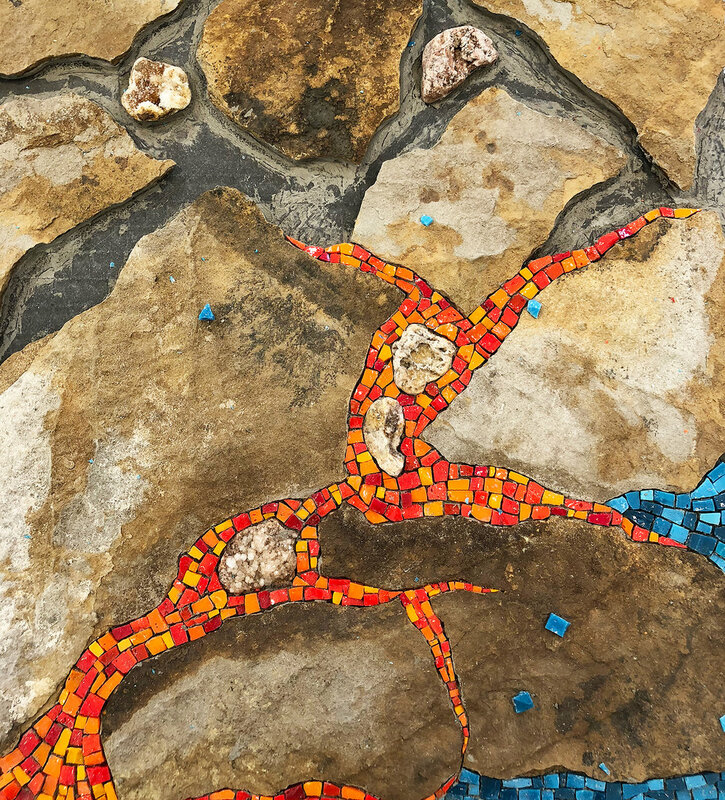 What a fun little mosaic! This is Stabby, my younger daughter's spirit animal, so to speak. She has a thing for unicorns, but not just any kind of unicorn. She refers to them as stabby demon horses; hence, the name Stabby. I wanted to make a custom mosaic for Allison for her birthday, and she really wanted me to recreate her unicorn (below left) in mosaic. The more I thought about this, the more I got excited about it. We decided that I would make a mockup to explore the effects of the black smalti against a white thinset background, and if the white of the thinset is what she wants. Allison is a software engineer for Apple, and she is also a writer. She created the pixilated unicorn, shown below on the left, as a logo for herself, using a 16 x 16 grid. Below right is one that I modified and that she has approved. Her original does not have an eye and she is still thinking on that. I tried a red eye, and a few shades of gray. Then, she suggested one that is the same as the cement. To avoid the mess of putting the white cement into the black square hole, I created a little cement cube. I'm thinking of working within the pixilated format, in 1.5" or 2" squares. This would yield a 16 x 16 grid of 24" or 32" square, respectively. Then a few inches around the grid for the thinset background. 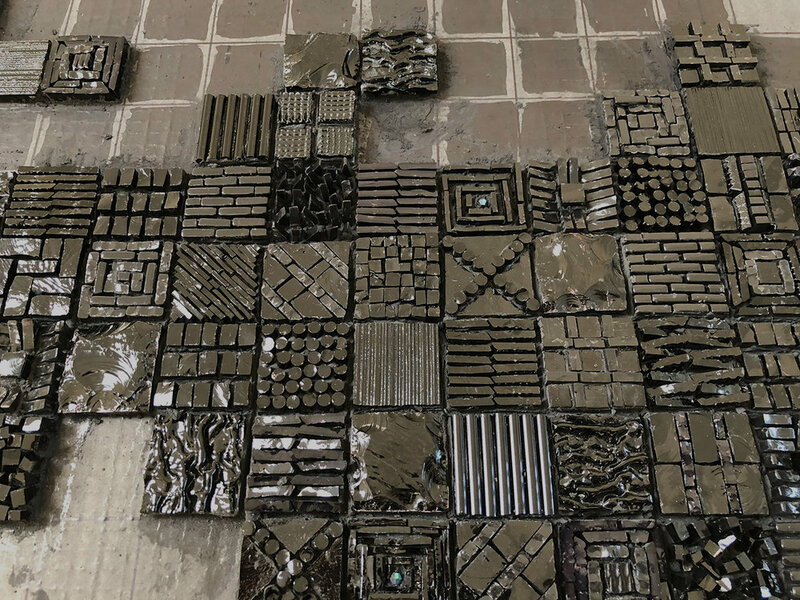 Within the grid, the unicorn squares would be various textural patterns in primarily black glass. That's the thinking right now anyway. Fullness (1999-2018) 5' x 3' / 152 cm x 91 cm. I can't believe I'm actually going to finish this old thing, and before its 20th birthday. I crazily started this back in about 1999 and did not know what the heck I was doing! I think the border may be a bit heavy, but that was the first thing I did on it, way back when, which made it very difficult to dispose of. It's taking a lot of discipline to resist redoing 19 year-old work, but my gosh! I still like the original concept but I would SO do it differently now. I have suffered a bit of embarrassment in sharing this embarrassment, but I thought it might at least be instructional. You can find my previous posts about my revisiting of this work here: Fullness. Fullness, wip. 1999-2017. 60" x 36"
I've finished the water with the moon reflection. I studied a lot of images of moon reflecting on water, but admit that I did not study the mathematics of how the moon reflects upon water based upon where it is in the sky. Since I am not going for realism and perspective in this old piece, I chose the type of reflection that I thought I would have chosen back in 1999, if I'd had the wherewithal to imagine such a thing. It's been enjoyable to work on this old mosaic and I may know why that is. I'm not terribly attached to an outcome and I feel free to experiment. I can't know how much this new mindset is related to the fact that I am finishing upsomething that I started back in 1999 and, in attempting to harmonize the new work with the old work, I am allowing myself to work in a more relaxed manner and with a sense of adventure. I am hoping that my interior work over the last couple of years has also been productive, but will not know the extent of progress on that front until I move on to new work. Soon, I'll start the several square feet of sky. First, however, I will take a few days away from this mosaic to work on a small commission I've got going. I'll post about that when I make a little more progress.